You may be wondering how to make your toddlers to know if its time to sleep during night or its time to wake up in the morning when they don't understand the ordinary clocks the adults use. Also some toddlers are made to sleep in a separate room than their parents. Sometimes they wake up too early in the morning (like in the time range 4 am - 6.30 am) and would go to their parents room thinking that the sun might have come up for the day to begin. That way the sleep of parents also gets disturbed when they expect their child not to rise before 7 am (or any other time as per the requirements) in the morning. The noise of the alarm (set in the alarm clock) is also not useful sometimes as the child may not know if the alarm already rang. So it makes the life difficult when toddlers don't understand the timings in the ordinary clock used by adults. A unique product has been launched by Gro Company in the form of an alarm clock specifically made for toddlers and young kids. Millions of parents are making use of this product and ratings are just perfect from parents who already bought this. This clock product is better known as Gro-Clock Sleep Trainer. This is in round shape with great design and there are two pegs on the base to make it stand on the surface of the bed. This sleep trainer clock has a glowing screen whose brightness can also be controlled using a particular button on it and thus giving a good option to use it as a nighlight as well because you can lower the brightness during sleep at night. Most importantly it doesn't require batteries and operates through the mains (electricity) with the help of an adapter supplied along with the purchase. Its major function is that it contains pictures of stars and the sun on the screen which actually help to determine whether its still night or the day has come up to get out of the bed. You need to know how to set it up to utilize its amazing functions. Suppose you want your child to wake up at 7 am in the morning. So what you need to do is that just set the time as 7 am and at exactly that point of time the picture of the last star (there are total 12 stars) will disappear and the picture of sun will come up on the screen of the clock. At 7 pm at night all the 12 stars will be visible on the screen (after sun goes off) and they will gradually disappear one by one as the night progresses and finally 1 star will be left before the sun appears on the screen at 7 am in the morning. 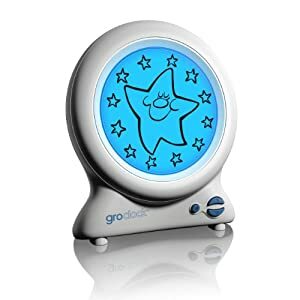 The number of starts left on the screen of the sleep trainer clock will give perfect idea to the toddlers how much time still left for the wake up. So this how this product trains the toddlers for a good routine wake up. However you need to make the toddlers understand this concept for first few days and there is also a demo button to show how the stars are going and the sun being appearing in a short time. DEMO button is just to make the children understand about the stars and the sun and how they act as day and night. When you will buy this product you will also get a story book along with it to make the children understand the importance of sleep in life. This clock can also be turned into a real digital clock when your child has grown up or when you need this clock to be used as an alarm clock by some adult. So it has a dual function. The product is also quite durable. This USB fan shows a clock display on the area of it's two rotating blades once switched on. This unusual alarm clock will fart you awake in the morning. I mean to say it will make farting alarm sound to wake you up in the morning. Please see at the bottom of the incoming page. This kids virtual reality headset gives 360 degree immersive experiences. Child will enter into a dream world. This cool wristband will encourage your child to become more active. More active the child is, more joules will be shown in wristband.